Human beings tend to either fear what they don't understand or to make their own far-fetched assumptions. In 18th and 19th centuries, this was certainly true between Americans and Japanese. Some of the interpretations of the culture and people across the Pacific are comical. The best way to help our students understand this historical perspective is through the eyes of the people who were living at the time. Visual primary sources are the go-to resource. All of the primary source images in this post are from John W. Dower's essay "Black Ships and Samurai" on MIT's Visualizing Cultures database. I love these simple charts from The Historical Thinking Project. Both would be helpful when implementing this lesson. The first helps students to put aside their modern bias because they have grown up in a time of instant communication and technological fashion. The second helps students compare historical perspectives that are at odds with one another, even when the creators of each source were living at the same time and saw the same things. In the 18th century the Japanese were mostly closed off from the outside world by decree from the Tokugawa Shogunate, the military government that controlled the nation of islands. One 1703 account portrayed North America as "a country cold and large... with many lions, elephants, tiger, leopards and brown and white bears." Moreover, the people of North American were depicted as fantastical creatures with giants holes through their torsos, multiple pairs of arms and legs, and feathers from head to toe in a scroll from 1720 entitled "People of Forty-Two Lands." The Americans were no less guilty of exaggerating their descriptions of what they did not understand. In 1852 a small book, Japan and the Japanese, was published to help Americans understand what the Perry Expedition would face when they arrived in Japan. Rather than accomplish its goal, the book only helped to further confuse Americans. 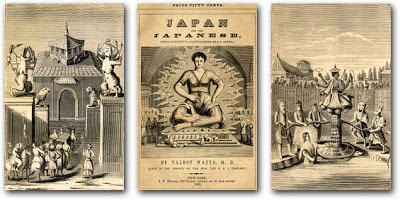 The two images that flank the cover with the title show the Japanese engaged in idol worship, something Christian Americans of the 19th century would have seen as barbaric and primitive. On the bottom left "The Habit of Japanese Soldiers" inaccurately depicts samurai in flowing Chinese robes and feathered garb. Finally, and most hilariously, "A Japanese Lady of Quality" shows a woman walking in public covered with a tented umbrella cone held by an attendant behind her. "Carrying the 'Gospel of God' to the Heathen" and a Japanese artist's American warship. Although the Japanese had some word of steamships and gunboats from the Dutch and a few other source prior to the arrival of the Perry Expedition in 1853, they were mostly unprepared for the reality that would face them as they looked upon the "Black Ships" in Edo Bay. In the illustrations above, the Japanese depiction of Perry's ship as a monster demonstrates the horror many citizens experienced from the shore. It is especially poignant when compared with the American artist's perspective beside it. The American piece is titled with the Protestant view of the purpose behind Perry's trip. As with all missions of Manifest Destiny, any other purpose was overshadowed by the responsibility to save the souls of the poor Godless heathens. Indeed, the heavenly sky seems to beckon the ship, a marvel of American engineering, out to sea so that it can teach the heathens on the opposite shore about the gifts of American ingenuity and the Christian faith. Of course, President Fillmore's real motivation was to provide stranded whalers with safe haven and a place to refuel their ships with coal. The desire to open up trade in the future was also important to him. The mission was all about economic gain and expanding American influence abroad in an age of imperialism. The American people wanted to feel as though this mission was a moral responsibility, though, and art like the painting above helped perpetuate that myth. The ship's hull is pitch black, smoke belches from its funnel, the figurehead on the bow is a leering monster, portholes high on the stern glower like the eyes of an apparition, the ship's sides bristle with rows of cannon, and gunfire streaks like a searchlight from a gun near the bow as well as from another, unseen, at the stern. The piece is such a powerful way to help students understand how people who heard about and witnessed the same expedition to interpret it so differently. "Old Bruin" or "Old Hog"
After exploring the bay for a few days, Perry and his entourage arrived on shore. There is no shortage of artistic interpretations from the Japanese. They are especially interesting to look at when compared with daguerreotypes of Perry taken less than a year after his return. Even his nicknames demonstrate a difference of opinion as to whether he was a hero or a barbarian. Perry's crew affectionately called the Mexican War hero "Old Bruin" while crewmen of the Japanese squadron chose more insulting names such as "Old Hog." When compared side by side the Japanese interpretation of Perry is clearly skewed, but when historical perspective is added it is not surprising that the Japanese were startled at his physical appearance when paired with the policies he was touting from the American president. There are more interpreted images with excessive facial hair and wrinkled skin at MIT's website. The larger lesson of teaching students about historical perspective is an important goal for any scholar of history, but the content information to be gained from these images is also incredibly valuable. The Japanese culture was rich and the world had much to gain from it, but without seeking to understand the truth about one another, the Americans and the Japanese made incorrect and often comical assumptions about the culture across the Pacific. This post is a reflection based on the author's coursework through Primary Source in an online class called Japan and the World.